It nourishes and restores the natural shine of hair’s fibre by up to 88.5% with the perfect balance of 7 of the best plant-derived oils to evenly paper your hair. It repairs damage caused by free radicals by up to 90%, preserving hair’s density and keeping cuticles sealed thanks to the concentrated properties harvested from soy amino acids and artichoke. It prevents up to 81% of the deposition of heavy metals and PM 2.5 particles caused by the pollution, protecting hair and avoiding damage to hair’s natural keratin thereby leaving hair nourished and with a natural shine. Extraction: mixture of cetyl and stearic alcohols that are produced naturally in plants. Benefits: these alcohols have the ability to prevent emulsions from separating between their oily and watery parts. These ingredients are also used to alter the thickness of liquid products, to increase foam capacity or to stabilize them. Extraction: chia seeds are a herbaceous plant belonging to the mint family. Chia seed oil is obtained by cold pressing the chia seeds. Benefits: Chia seeds are one of the best known superfoods. Its oil contains up to 60% concentration of Omega 3 and has shown to have remarkable benefits for sensitive skin. Extraction: quaternary ester of stearic acid. It is a completely biodegradable compound, partially of vegetable origin. It is approved by the COSMOS standard of natural and organic cosmetics. Benefits: it functions as an emulsifier and a conditioning agent, leaving hair smooth and shiny. Extraction: a vegetable ingredient obtained from coconut. Benefits: presents a high level of biocompatibility with skin and therefore has the ability to penetrate deep and help skin to repair itself. It acts as an emollient and provides skin with incredible softness. The natural perfume of the nourish restore mask contains different notes with high quality essential oils of papaya, grapefruit, sweet orange and bergamot, a combination chosen for its energizing properties. Extraction: this ester is obtained from the saponification (transformation of a fatty body into soap) and esterification of vegetable oils and sugars of natural origin. Benefits: excellent conditioner used in hair care products given its ability to improve wet styling and reduce frizz. This ingredient adheres to the cuticles and renews the lipid layer of the hair. Extraction: this vegetable oil is obtained by cold pressing the pulp and pit to extract the fruit’s natural virgin oils. Is is rich in antioxidants, fatty acids, proteins and minerals and contains high concentrations of vitamins E, A, B2, B3. Benefits: its protective and regenerative effect protect the skin from external agents. Studies have shown that it helps reduce dermatitis and to speed up the healing process. It improves the hydration of dry, cracked and damaged skin and also acts as an emulsifier. Extraction: sunflower oil is obtained from Helianthus Annus sunflower seeds. Benefits: rich in omega-6 and vitamin E, sunflower seed oil is used in the cosmetics industry as skin repairing agent. Prevents skin dehydration and has soothing, nourishing and antibacterial properties. It is perfect for treating all skin types including: dry, normal, oily and acne prone skin. Extraction: soy biopeptides are obtained by enzymatic depolymerization of soy proteins. Benefits: due to its protein composition, soybean biopeptides manage to protect hair from external aggressions, restore hair fiber and achieve a soft and radiant appearance. Extraction: argan is a small tree with a thorny trunk native to the southwestern region of Morocco. Its oil comes from the extract of the seeds that the tree produces. Its seed is similar to an almond and it is pressed manually until the oil is extracted. Argan oil extraction is a Berber tradition. Benefits: known as liquid gold, its main function is to nourish the skin and keep hair silky, manageable and shiny. It is a potent moisturizer and contains vitamins (primarily vitamin E), antioxidants and essential fatty acids (80%). It does not leave excess oil on the skin and absorbs quickly, so it is suitable for oily and acne-prone skin types. It also has healing properties and works to sooth skin irritations and inflammation. 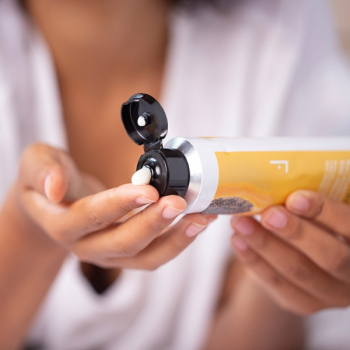 Extraction: it is harvested from the fruit of the African Shea tree (Vitellaria paradoxa) and provides numerous benefits to the skin and hair thanks to its rich composition vitamins (A, D, E and F) and minerals. Benefits: illuminates skin and hair, and provides additional hydration and elasticity. It is an excellent cell regenerator that offers intense hydration and long-lasting nutrition. It also acts as a natural sunscreen by combating UVA and UVB rays. It provides healing, properties and provides protection against cold weather damage. Extraction: it is obtained via a solvent extraction process from the artichoke’s basal leaves. This is where the highest concentration of biologically active compounds are found. Benefits: the artichoke is a rich in calcium and phosphorus, and vitamins A, B and C. Its extract is commonly used to enhance the natural beauty of hair. It nourishes, conditions by providing numerous minerals and helps to eliminate dandruff by forming a protective layer over the hair. Extraction: it is obtained directly from the seeds of soybeans, a legume rich in proteins with great energetic and nutritional value. This oil high in vitamins (A, B6, B12 and K), calcium, magnesium and potassium. Benefits: it is high in antioxidants and has moisturizing and firming properties. It also works to stimulate cell regeneration and sometimes works as a surfactant. It easily penetrates deep into skin to stimulate the synthesis of collagen, elastin and other proteins that help keep skin firm. Extraction: It is one of the most cultivated cereals in the world, second to wheat, according to the FAO. It is a grassy plant rich in chlorophyll, vitamin C, antioxidants and minerals. It has great nutritional properties. Benefits: Detoxifies the body of harmful toxins and helps skin maintain elasticity, making it a good anti-aging treatment. It reduces inflammation and creates a protective barrier on the skin to protect against external contaminants. Also acts as an emulsifier and an antioxidant. Extraction: The apple is a very refreshing and moisturizing fruit because of its high water composition. It also has antioxidant properties. Extraction: wheat extract comes from the seeds of the wheat plant, a grassy plant rich in vitamin E.
Benefits: works as a powerful cell regenerator and antioxidant, providing healing properties. It improves blood circulation and the overall appearance of skin. Its antioxidant properties prevent premature ageing, providing the skin with extra firmness and preventing wrinkles from forming. Extraction: plant of the genus Panax. Its roots are used for their active ingredients, which are potent antioxidants. The plant is frequently used in Siddha medicines. Benefits: it acts to block heavy metals and PM 2.5 particles from the air, improving the skin tone and hydration. It balances the body reducing stress and at the same time acts as an anti-inflammatory. It is also considered an aphrodisiac. Extraction: rosemary is an aromatic, woody, evergreen shrub with many small branches. It can grow up to 2 meters in height. It grows on all types of soils, preferably dry, somewhat sandy and permeable soils. Its extract is obtained from the rosemary leaves via a maceration process. Benefits: this rosemary extract provides significant anti-inflammatory and antibacterial properties thanks to its high concentration of rosmarinic acid, which is used to treat sensitive and irritated skin. On the other hand, its carnosic acid and carnosol content act as antimicrobial agents, protecting against gram-positive and gram-negative bacteria. 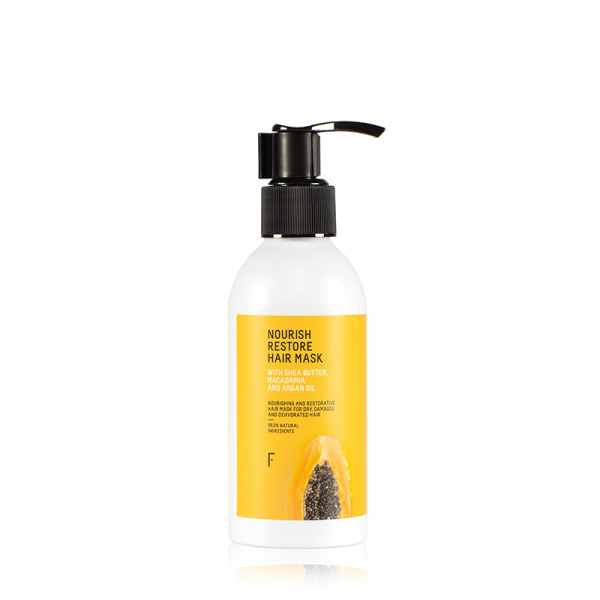 In general, this extract has a remarkable antiseptic and astringent properties which help to repair and strengthen hair growth from root to tip. Extraction: aliphatic triterpene extracted from rice bran, wheat germ and green olives. It is 100% natural. Benefits: it is a natural component and a good emollient and restores skin’s natural sebum content making it great for treating dry skin. It also has antioxidant properties and works to stimulate the immune system. Extraction: benzyl alcohol is a mild preservative widely used in cosmetics for products with an aqueous base. It is produced by fermenting sugary plant solutions and is approved by the certifier “Ecocert”. Benefits: prevents cosmetics and personal care products from deteriorating and becoming contaminated by preventing the growth and reproduction of microorganisms. It works as an antiseptic, astringent and freshener. Extraction: non-ionic surfactant and co-surfactant of vegetable origin, biodegradable and very suitable for use in shampoos and shower gels. It is obtained from renewable raw materials such as coconut oil and the sugar found in fruits. Benefits: it reduces the potential for irritation caused by surfactants and improves hair styling, in addition to softening it. Extraction: natural ester of vegetable origin of glycerin and caprylic acid. Benefits: acts as an emulsion stabilizer and a moisturizing agent. Extraction: glycerin ester and undecylenic acid. The undecylenic acid comes from the castor oil obtained from the seeds of the Ricinus communis plant. The glycerin ester comes from canola, a plant of the Brassicaceae family. Benefits: it is normally used in cosmetics products as an emulsifier. It also has anti-microbial properties. Extraction: natural polysaccharide of high natural weight derived from the fermentation of carbohydrates such as glucose or corn syrup. Benefits: it is used as a binder, emulsion stabilizer and skin conditioning agent in a wide variety of cosmetics and personal care products. 1% of xanthan gum is used for cosmetic formulations. Extraction: sodium salt from phytic acid, a vegetable compound found in corn. Benefits: it is used in cosmetic products as a chelating agent to prevent the toxicity of heavy metals. Extraction: dehydroacetic acid is a mild preservative widely used in cosmetics for products. Benefits: prevents cosmetics and personal care products from deteriorating and becoming contaminated by preventing the growth and reproduction of microorganisms. Extraction: tocopherol or vitamin E, is naturally found in vegetable fats and oils, cereals, nuts and green and yellow leafy vegetables. Benefits: it is used in cosmetics for its antioxidant properties and also acts as a skin conditioning agent. Reduces the appearance of stretch marks, helps improve skin tone, moisturizes and helps keep skin firm. For hair care, Holy Basil helps improve the blood circulation in the scalp which stimulates hair growth and helps to condition hair and provide shine. Extraction: gluconic acid ester obtained via bio-fermentation. Benefits: a composed of multiple hydroxyl groups that attract water, leading to increased skin hydration. In other words, it acts as a humectant. Extraction: fatty acid from vegetable origin. Beta-Sitosterol is naturally produced in many fruits, vegetables, nuts and seeds. It is similar to cholesterol, which occurs naturally in the skin and is considered part of the intercellular matrix of the skin. Benefits: it provides a lot of hydration and acts as an anti-inflammatory agent. Extraction: Calcium salt from gluconic acid. Benefits: It is used as a skin humectant and conditioning agent in cosmetic formulations. Extraction: also known as geranial, is a natural compound with lemon citrus aroma. It comes from the essential oils of a series of plants that include: lemon grass, lemon myrtle, lemon and orange blossom. Benefits: it is used in perfumes as a natural component of essential oils. It is refreshing, rich in vitamins, stimulates microcirculation and nurtures tissues. Extraction: monoterpene with floral aroma and a touch of menthol. This natural fragrance, is sweet and smooth. It is produced by a wide variety of plants such as mint, cinnamon, citrus fruits and birch trees. Follow this routine at least once a week , but 2-3 times a week during summer, or whenever you feel your hair dryer. Ginseng Protect is formed by combining ginseng, apple, peach, barley and wheat. It provides hair fibre needed protection against the harmful effects caused by heavy metals such as lead, mercury or cadmium and also protects against PM2.5 particles that can be caused by the pollution. Shea butter reduces frizz by providing moisture and restructuring dehydrated and damaged hair. This plant-derived oil acts as a strong cell protector and nourishing agent. MUSK ROSE OIL High concentration of omega 6 and 9. The benefits of Musk Rose Oil are not yet widely known. With a high concentration of Omega 6, Omega 9 and Beta-Carotene, Musk Rose Oil offers the hair fibre more effective protection and increases shine. Almond Oil has a great deal of hydration properties which work together to counteract premature keratin degradation. This non-fatty hydration also provides the perfect source of nourishment to leave hair feeling healthy and soft. It is always risky to do what others don’t, but that’s where the magic happens. 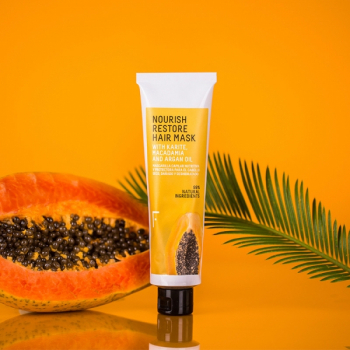 The Nourish Restore Hair Mask is a powerful silicone-free nourishing hair mask with a high concentration of top-quality plant-derived oils and active ingredients working together to repair damage caused by external agents, create healthy hair fibres and seal cuticles. Shake it! Apply the needed amount on your hands according to hair’s density and length. Divide hair into two parts to help with even distribution, then divide hair again into smaller sections massaging product into hair. Apply product about 2 centimetres from the roots and distribute evenly evenly until reaching the tips. Rinse with a generous amount of water to ensure that no residue remains. This step is particularly important because of the number of natural oils.